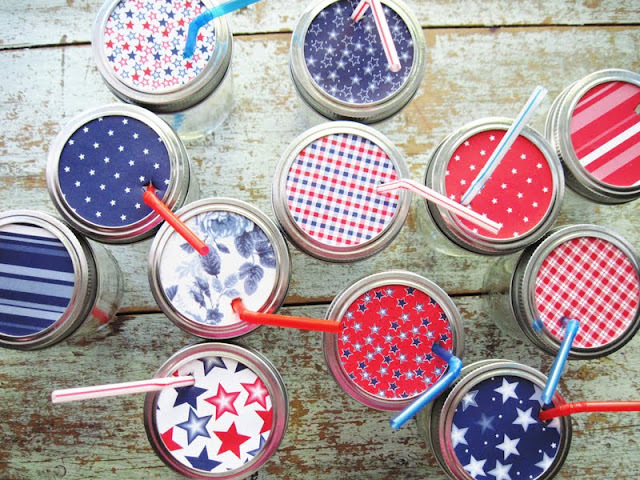 Here's a quick and easy DIY for the 4th or any other party. I am all for some pretty mason jars or glass bottles with pretty striped straws. But if you have a big family reunion or a large party you are going to need something more practical. Why not make custom cups with some fabric or paper? 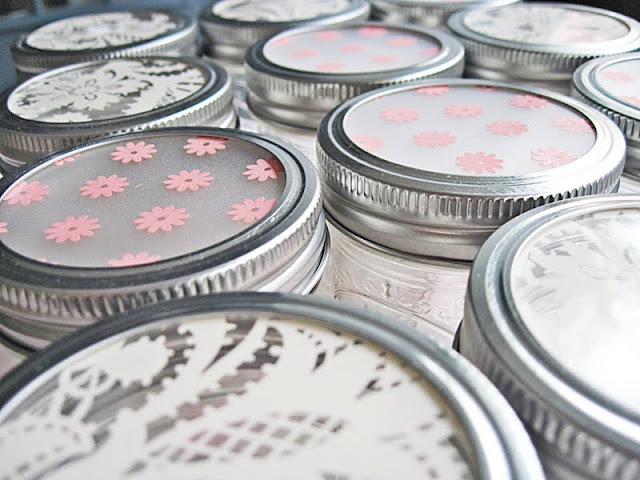 Take some clear plastic cups and cut out fabric or paper circles and place your glue "pretty side up" with a bit of mod podge (it dries clear). Fast, easy, colorful! Mine are both fabric and paper. I just traced the bottom of the cup but if you are using paper, you can use a circle punch too. So easy and makes for a little custom flair to your party! I need to start off by saying that this year has marked the year of my obsession with stripes. I am not sure why I love them as much as I do but anything remotely nautical or preppy has me over the moon in love. So I have been dreaming of doing a Nautical 4th of July series for this year. And I am kicking it off today. Hooray! I really wanted to use striped napkins this year but could not find any. And so they kind of turned into an unexpected DIY project. I could not find any fabric anywhere with the stripes I wanted and the ones I found retailed at $14 each. Gah! So I figured a little fabric paint and inexpensive white napkins would do the trick. So a tutorial was born! 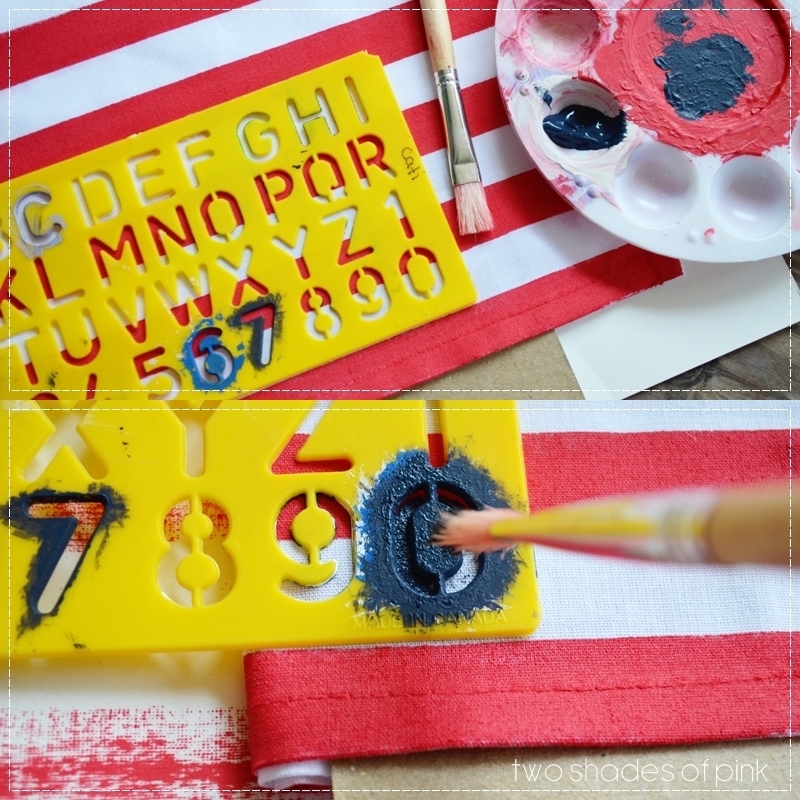 What you need: White napkins, red and blue fabric paint, masking tape (or painters tape), paint brush, number stencils, cardboard or poster board. 1. 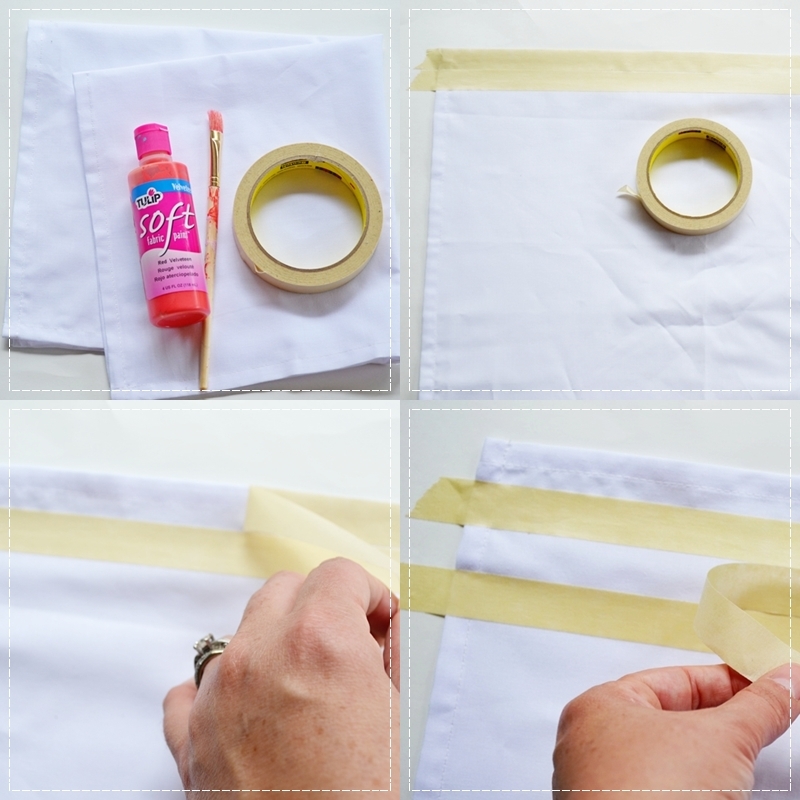 Iron your napkin and lay it flat on top of cardboard or poster board. 2. Carefully place one strip of tape the length of the top of the napkin. Do the same thing right underneath it with another line of tape. 3. I wanted the first stripe to be painted red so I removed the top strip of tape and placed it directly under the second one. Then I placed another strip of tape underneath that and removed the one above it again. This is how you create your stripes all the way down. It also helps that the tape stabilizes the napkin onto your poster board. Now start painting the exposed white lines your red color. 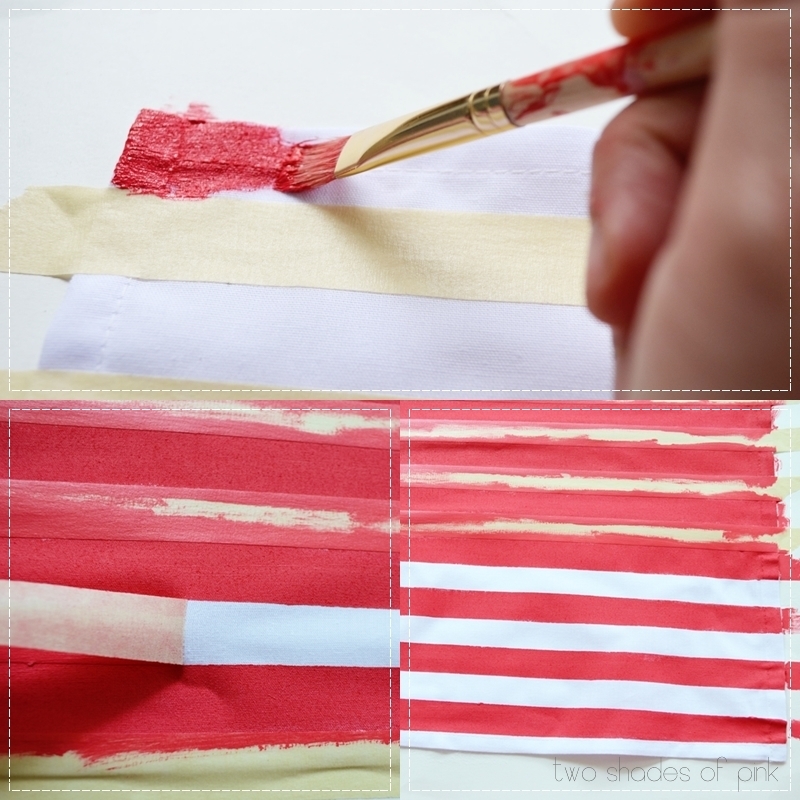 Once dry, peel your tape strip to reveal your fun, striped napkin! My goal was to make the napkins look like a sailboat sail so I stenciled 0704 (July 4th) onto each corner of the napkin with a midnight blue color. The monkey fist knots are not really the best knots I could have done. They are supposed to be tighter and much more ball like. I just learned how to make them (my husband knew how and after researching for days I finally asked him if he knew how to make one and he said YES! Who knew??) I am still practicing and getting better at it and it is a good idea to put a styrofoam ball inside one to help shape it into a ball. But I figured these still look super cute and nautical like. Right? RIGHT???!!! A photo tutorial would have been close to impossible so here's a great link at animated knots for making a monkey's fist knot with great step by step photos. I have more ideas to share with you over the next few weeks until July 4th. Stay tuned my beautiful friends! Before I give you the winner of the 4th of July wreath giveaway, I have to apologize for being so late with this. I actually just got back into town late last night after going up north for my grandmother's funeral. I have to tell you, this was really tough. I was very close to my "Mema" and I miss her terribly. Last week, she had taken a turn for the worse and I was trying to get up there to say goodbye. Sadly, I did not make it. I am so grateful she died peacefully in her sleep at the age of 92. She was the spunkiest, sweetest, little Italian lady you would ever meet. She would have fed you, said you had gorgeous hair, and that you needed to lose a little weight. Ha! She has 9 grandchildren and 19 great grandchildren. She was a treasure to all of us and I miss her so much. But I know I will see her again in Glory! I had the wonderful opportunity to share a letter at her funeral that I wrote the morning after she died. In it, I tell her how much I love her and then reminisce of memories. It gave me such peace and I feel like my grief has been lifted after writing that letter. So know I wanted to get this earlier but just did not have the time. So sorry! "Love it! I would love to hang it on my front door to welcome friends and family." I have no way of contacting you so I hope you see this post! Email me at twoshadesofpink at gmail dot com so I can get this wreath to you! Thanks to everyone who entered and I hope to make another one in the next few months and do this again! Now I am off to pack for my anniversary getaway with my hubby! We celebrate 10 years tomorrow! Remember this pic from last year's post? I look so young and I can't believe 10 years has already gone by! If you follow me on instagram, I hope to post pics of our little getaway. I have to confess...we have never, ever, since having kids, gone away alone. Like on VACATION alone. I am beyond STOKED for this! WOO HOOO! Love you scrumptiously sweet friends! Well I'm doing what I love to do every year. Some 4th of July making!. Just love it. Maybe it is the red, white, and blue color scheme, my patriotic heart, or just the fact that so much of this day is spent eating and casually entertaining! Mmmm...fooooood. So I thought it would be fun to share last year's projects with you. These little Mason Jar "Sippy Cups" hold the grand title of being the single most popular project on my blog. 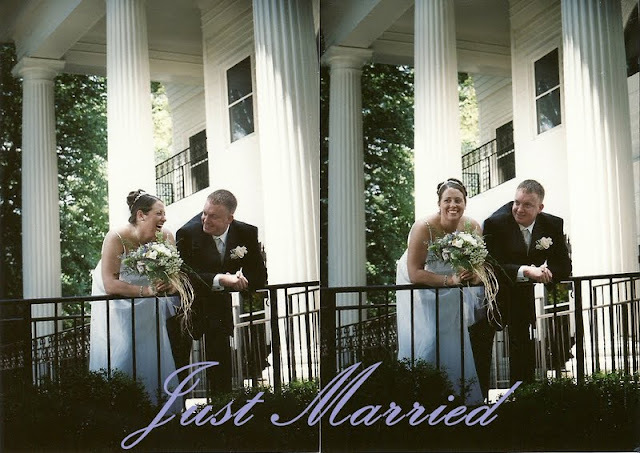 My only regret is not using some striped paper straws to style the photographs. But they are still kinds of adorable. You can check out the full tutorial here. I also upgraded these cups and used plastic paper for the girl's birthday party last year. That way, you don't worry about making the paper wet. Check these out here. And these are actually for grown ups and older kids. Not really meant for little ones to carry glass and slosh around lemonade with paper lids. This was another popular one from last year. 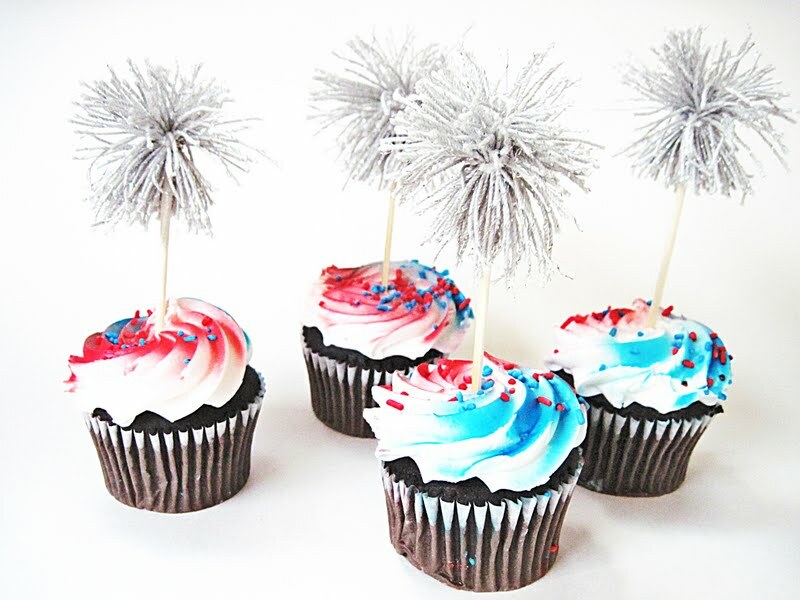 I adore these Sparkler Cupcake Picks! LOOOVE THEM! They are so simple and easy and they look just like little sparklers. I also give you a full tutorial for these. 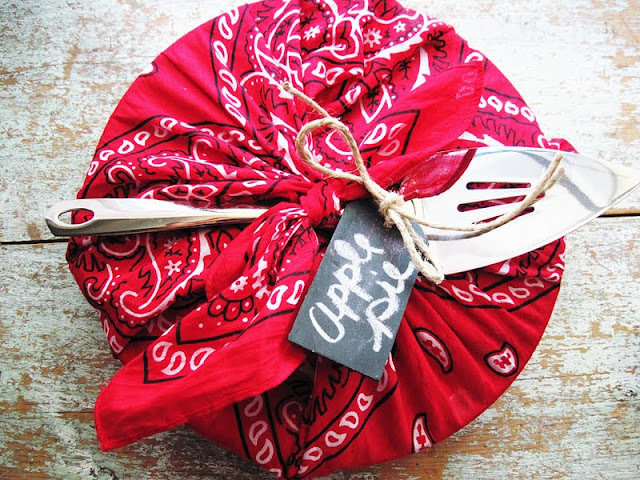 During the series, I showed different ways to use a bandana. This particular one was my favorite wrapping a pie and sliding a pie server in the knot. Isn't it just so sweet? 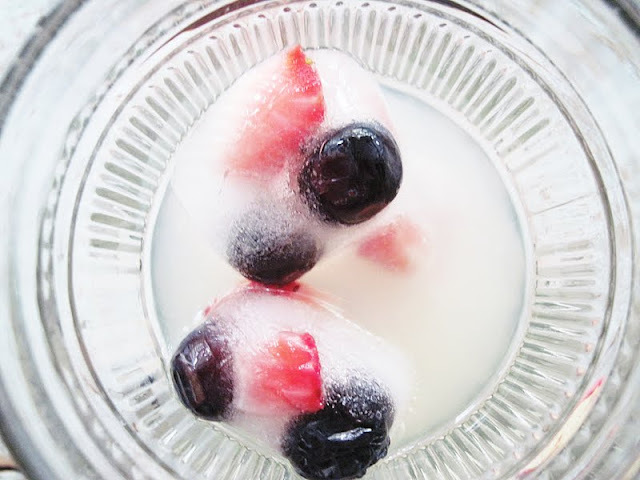 I am by no means a "go to" source for food but these berry ice cubes make a fun little treat for your lemonade. Try to find some star shaped ice cube trays to make it extra fun. Or some star shaped sugar cookies to make ice cream sandwiches. 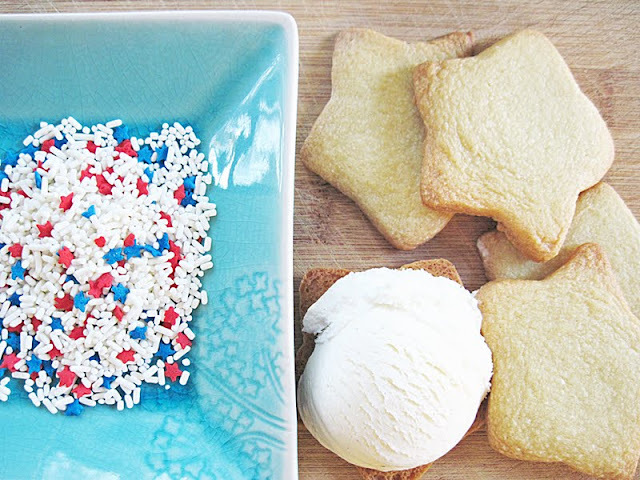 Just sandwich some ice cream between two cookies and dip sides into red, white, and blue sprinkles. Hope you liked a little blast from the past. I hope to start sharing this year's ideas with you sometime this week. Lots of hugs and hope your summer is off to a wonderful start! Happy Saturday my sweet friends! I have to tell you...your response last week to my previous post...just wow. You have no idea what it did for my heart to have your full support and understanding. It actually made me want to post all the more which of course...misses the entire point. But it meant so much to me. I am so sorry I have not responded to any of you by email. Your precious messages have been read and reread numerous times. I actually have been too busy working on this ruffly and pretty 4th of July wreath so that I can give it away to ONE OF YOU! You guys might remember my other ruffly wreaths like this one and and this one. But I wanted to make one that was festive for the 4th of July and get it up on the blog so that I could get it to the winner before the fireworks start. Timeliness, is sadly...not my strong suit. I just love ruffles. They can prettify just about anything. And this wreath just screams summery happiness to me! I love that is mimics a flag with the smaller white ruffles creating the look of stars on the blue part. And the best thing? My girls helped me make this. Because they are budding, crafty geniuses...that's why. It was loads of fun and I am so excited that one of you could win it. If you want to follow along...well that is just fine and wonderful because I would sure love to meet you! Here I go again with the ruffles. I just can't help it. Let's just have a moment of silence for ruffles, shall we? They are worthy of such contemplation. Leave a comment telling me where you would put it or who you might give it to. It will end by midnight Thursday June 14th. I will announce the winner Friday June 15th. If I get a lot of entries, I will make another one (that can be used any time of the year) and do another giveaway later in the summer. I have missed you. Terribly. But to be honest...I may not be round these here parts this summer. You see, I have made a decision. I want to be more intentional in spending time with my family. To stop staring at this glowing rectangle while my kids giggle in the background or my adorable husband reads a book when I could be snuggling with him. I want to be the woman God has called me to be for this particular season of my life. I am a Christ follower, a wife and a mother...FIRST. No worries. I am not ending it all on the blog. But I have finally decided that my blog is my own. As if it somehow ceased to be mine. But I found myself wanting to appeal to others instead of staying true to my own voice, my own style, my own way of doing things. Posting a kid craft and that might turn people away. My love of packaging posts would grow wearisome to those who come to see other crafts. I would disappoint those who like my party planning when I'm not doing a party this year. 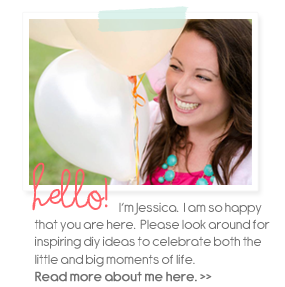 I would fight the rising jealousy in me over another crafter's success or growth. I felt REQUIRED to have a linky party, sponsors, or do posts that would draw more readers. I would feel failure over reduced stats or followers leaving. (Such a fun word...we just got back from a Disney vacation and I heard a family from England say that and it just sounds much more dignified then words like garbage or crap. I completely intend to use this word often and with a slight British lilt). Now I do have fun things in the works this summer. One of my favorite crafting holidays is the 4th of July and I hope...HOPE...to pull off a series like last year. I also have a fun photo shoot project with a friend who is a photographer. I make...she shoots. See? Good stuff. But I don't want to commit to a certain amount of days per week of crafting, posting, etc. OK. You got my long winded "Summer Disclaimer." Now on to my simple bucket list. All I did was wrap washi tape around the tops of some coffee stirrers and wrote our summer ideas on the bottom part. Pretty simple. We wrote them down as a family at dinner and the girls were amazing at coming up some really good ideas. Last summer, I kind of winged it each day. And without a plan, I got a little frustrated. I have no intention of jamming our days with a ton of places to go and things to do. The girls and I will embrace the ideal of a "lazy summer." But we want to have fun and make loads of memories too. Here is my list in full. I have no doubt we will add to it but I started with 50. Maybe you have seen a lot of these ideas already and some do cater to where we live or the ages of my kids. But maybe it will inspire you a bit too. Until next time my sweet and precious friends!